Below is an idiosyncratic history of IANDS, as told by the recollections of all its presidents to date. It was published in our magazine, Vital Signs, 1999 No. 4. Additional articles were written for the 30th anniversary of IANDS in 2011. The Early Founding of IANDS, by Raymond Moody, M.D., Ph.D.
An organizing meeting was held in 1978 in St. Louis. Shown here (left to right) are founders Ken Ring, John Audette, Bruce Greyson and Michael Sabom. My friend John Audette was the conceiver, originator, organizer and founder of IANDS. I met John in February of 1974, when he asked me to lecture on my work to the Sociology Club at Augusta College in Georgia. Due to his organizing skills, the auditorium was packed for my lecture. He was obviously touched by my report, and we became good friends. Several years later, he had the idea of forming the group which became IANDS. He asked me to endorse his project, which I did. John traveled around the country on his own initiative. He met the various medical doctors and psychologists who were then waking up to the extent of this amazing phenomenon we call the near-death experience. He arranged for us to all get together in Charlottesville, Virginia, where I lived. My remembrance is that the founding of the group was in November of 1977 or 1978. We met in a room at the Baptist Student Center in Charlottesville. Present at the initial meeting were John Audette, Ken Ring, Mike Sabom, Sarah Kreutziger, Beverly Belk, Bruce Greyson, John Egle, my wife Louise, and myself. There was also a psychology professor, whose name I forget. He didn't seem to enjoy our company, and kept dozing off. He decided not to stay with us after that. There may have been other attendees, as well. I just don't remember. We spent the day conceptualizing. I made it clear from the beginning that I didn't want any sort of organizing, administrative, or leadership role in the group. I am not a joiner or social person, and I like to work by myself. That day I just sat there, rocking in my rocking chair, contributing some ideas and telling stories about my imaginary town. So make no mistake about it: John Audette was the originator and founder of IANDS. For a long time he kept the organization going on his own determination and resources. Later on there was a meeting at my farm in Highland County, Virginia. That came about as a reunion of the original participants. The organization had already been running for a while when we met at the farm. Late in 1980, John Audette, who, while living in Peoria, had been single-handedly running the NDE organization that was soon to become IANDS, asked me if I would take it over for a year so that he could concentrate on doing some NDE research of his own. In December he came to visit me in Connecticut and we made the transfer then. I decided to rename the organization The International Association for Near-Death Studies, establish a journal, and generally do things my way (we didn't have a board to worry about then! ), and with the help of John and Bruce Greyson and a horde of good-hearted student volunteers, I did. I first approached my department head at the University of Connecticut and managed to get an old unused office (we eventually needed three) to set up shop, and then I recruited a bunch of my students to help run it. A then-graduate student (now an English professor) named Steve Straight was one of my main assistants, and he edited the magazine, Vital Signs. In those days before desktop publishing, everything had to be done by hand. We would stay up all night doing pasteup to get the magazine out on time. Then, several volunteers and I would crowd into the office, affix labels, munch pizza, and cart the things over to the Post Office and send them out. A student of mine, Leah Andrews, with her faithful dog Partner, ran the office then and helped me with the mountains of correspondence that soon started flooding in. A dreamy art student named Ned Kahn designed the IANDS logo. We had fun, we had a wonderful esprit de corps, though some weeks I worked a hundred hours between running IANDS, teaching at the university, and shooting my mouth off at lectures around the country. I was young then. We had a ball, and we didn't spend a cent on salaries. That was what IANDS was like in the early days. Nothing would have been possible without the tireless and devoted help of those students. In reference to the continued work on NDEs, I would say if the findings of NDE research continue to spread and to be absorbed into the collective psyche of humanity in the 21st century, then at least those of us who have been a part of this movement in the century just concluded can feel that we did our part to help humankind attain this kind of awareness. Our task, it seems to me, is not so much to speculate about what will happen, but to live, as much as possible, in this awareness now so as to bring it into the world and allow it to permeate our interaction with all beings. I was introduced to NDEs, as were so many others, by the publication of Raymond Moody's Life After Life, in 1975. The difference in my case, however, was that at the time that book was published I was one of Raymond's supervisors in his psychiatric training and was able to read the thousands upon thousands of letters he began receiving from experiencers all over the world. I was immediately intrigued by NDEs and when John Audette organized a group of interested researchers two years later to carry forth Raymond's torch, I was eager to participate. The organization born at that meeting later became IANDS, and I was happy to play a secondary role to its development while John and Ken Ring did all the hard work. Those were the days not of shoestring budgets but of no budgets, of volunteers running out of the office Ken somehow finagled out of the University of Connecticut and of Board Meetings on Raymond's farm in the remote mountains of western Virginia. Many of those board meetings ended with our scratching our heads over our annual expenses, and then Ken pulling out his checkbook and shaming the rest of us into doing the same until we had enough to pay the bills. We dreamed of some day holding annual conferences with hundreds of experiencers - and seriously fretted about the potential physical damage to a building in which we tried to put hundreds of experiencers, all vibrating with their heightened energies at the same time! In 1980, when Ken and John proposed that IANDS should create a scholarly journal for near-death studies, I vehemently opposed the idea. I believed that if we started our own journal, no one outside the field would read it, and our work would go unnoticed by the greater scientific community. I thought it would be better for the field in the long run if researchers had to publish their work - admittedly against the odds - in mainstream journals, where it would be readily available to scholars unfamiliar with the phenomenon. I lost the argument, and the journal was born, first as Anabiosis and later named the Journal of Near-Death Studies. The irony was that barely more than a year later, when Ken needed a sabbatical, he cajoled me into temporarily taking his place as President of IANDS and Editor of the Journal. I willingly stepped into the breach, taking the helm of the fledgling organization and its journal, eager to do my part. When Ken returned the following year, however, he resumed the Presidency but decided he no longer wanted to edit the Journal, leaving me holding the bag I never wanted in the first place. Although I now regard the 18 years of my Editorship of the Journal as perhaps my greatest contribution to near-death studies and have enjoyed it immensely, I still wonder whether the field would have advanced faster had we never had our own journal. My other legacy, from my many years as IANDS' research director, was assembling from the IANDS membership pool of several hundred experiencers and non-experiencer "controls" who patiently and faithfully filled out my questionnaires year after year after year. Many of those questionnaires eventually resulted in research reports that were published in mainstream scientific journals - and many are still being rejected from one journal after another, apparently documenting findings that are just too outlandish for scholarly journal editors. But as much as I have enjoyed the science of this work, the true joy has come from the powerful and loving friendships I have gained from this work. Many of my "research subjects" I eventually met when we became bold enough to actually hold annual conference of NDErs - and many others I still feel incredibly close to, even though we have yet to meet face to face. And it is this vital personal conviction with the other members of the IANDS family that inspires my hopes for the future of IANDS. When we first started this organization, now more than two decades ago, we had both dreams and fears of great magnitude, of near-death research transforming science and medicine and indeed all of western civilization, and of meetings of NDErs quite literally bringing the house down with their resonating energies. Now that I am 20 years older and more experienced, if not wiser, my hopes are more humble and at the same time more profound: that this work we are doing will transform not civilization, but men and women - and children - one at a time, as they struggle with the effects of their spiritual awakenings or with their yearning to have such an awakening. Yes, I will continue to pummel the medical establishment with my research reports documenting outlandish findings, but I no longer expect or need a scientific revolution. Knowledge I have found to be a secondary fruit of the NDE, and different experiencers (and researchers) take away only as much as they can handle or understand. The primary fruit of the experience is the opening of the heart. What I wish for IANDS in the new century is not that it shake the materialistic foundations of Western civilizations, but simply and more importantly that it continue to help individual experiencers and seekers open their hearts to the love that is our reason for being. When I assumed the presidency in the mid-1980s IANDS had passed through its formative period. The pioneering work of Elisabeth Kübler-Ross and Raymond Moody had been followed by the embryonic scientific studies of Ken Ring, Bruce Greyson, and others. Popular interest was unfolding and the first television programs featuring NDEs had aired. We had no doubt about the topical interest; it was how to tap into the general public that seemed to elude us. The critical topic at every quarterly board meeting was how to raise funds to insure institutional survival until the next meeting. A critical organizational error had occurred earlier. IANDS had hired several full-time staff members. All were dedicated to the cause, and more importantly had become our friends. Board members were in angst constantly over the possibility that we would have to let them go when we felt a personal responsibility for their continued employment. We were caught in a classic Catch-22 situation. We needed the staff to run the office so that IANDS could generate money; but the funds were insufficient to support the staff. In addition to economic issues a philosophical schism was emerging. That was the differing reasons for participating in IANDS. Two major camps evolved. On one side were the scientists who wanted to better understand the underlying nature of the phenomenon we mistakenly called NDEs. The implications of that question were so overarching they would lead to an understanding of the meaning of life itself - or so we thought. The other faction was comprised of experiencers and caregivers. They were not so much interested in being studied as in obtaining help for those who had been traumatized by a psychologically overwhelming situation, one for which most had no preparation. Don't study me, help me, was their plea. Exactly how is still unclear, but IANDS survived my tenure - just barely. What will the study of NDEs bring in the 21st Century? As noted, in the early phases of IANDS we hypothesized the importance of the topic and privately addressed the teleological implications. It seems to me that the question has already been answered. The issue is not defining the answer - it is in recognition of that answer. Specifically, I am talking about the deep philosophical thought that already exists about the true nature of man's relationship to the universe. It is a spiritual understanding that must be inculcated by each individual. Rarely are the fundamentals accepted and practiced by large social bodies. There are too many competing factors in daily life for most people to dwell on the deeper meaning of existence. Certainly, modern society has over-emphasized material values versus spirituality. Personally, I find it highly unlikely that any body of intellectual knowledge will change that. Rather, understanding will only come to individuals and groups that personally experience a reason for such change. At a lecture in early 1971, George Ritchie, M.D. 's message of his near-death experience had very powerful effect on me. This interest continued, as death for me has always been a mystery since I was nine years old when my father died. It was a year after this lecture that a psychiatrist friend, Paul and I were invited to spend the weekend with George and his lovely wife in Virginia at their waterfront home. It goes without saying that this encouraged my seeking to understand the near-death experience. Thus, when IANDS (and pre-IANDS) came into being in the late '70s my fate was sealed! My board service began at the meeting in 1982 when Bruce Greyson was serving his term. Then Ken returned for another year's term and was followed in 1984 by John Alexander. It was in the fall of 1986 when I was Vice President that my phone rang one night and John's voice said, "It's yours, Pat." My response was, "What's mine?" His response was "the presidency of IANDS," as he was changing military assignments. At that time we were still struggling financially. Thanks to Bruce Greyson and the others he recruited in the Hartford, CT area, they held it all together for the next six or eight months. Then the office moved (in Bruce's car) to Philadelphia where a group of board members and others assisted in the operational activities. During the four-and-a-half years it operated out of Bob & Bev Sullivan's house and garage (Bob was the treasurer); for a while some activities were here at our home at 3310 Baring Street. Those were the years when Leon Rhodes, Jayne Smith, Judith Miller and others in the Philly area were very generous with their time and talents. The other board members were also supportive during these difficult times. The major activities which transpired, with difficulty at times due to the financial status, were the regular issues of Vital Signs. The journal's bills somehow got paid. However, in the late '80s we started a small newsletter under the name of Revitalized Signs, only as a interim until we could again return to Vital Signs. That which seemed to turn the tide for us was the plan we made in early 1988 to hold our first annual conference for IANDS in June 1989. Our plans were for a three year cycle. The first conference in '89 was to be primarily for IANDS USA. The 1990 conference was to be international in scope, and the 1991 was to be five regional conferences in the U.S. The 1989 Conference was held at Rosemont College with around 200 people from across the country and some from Canada, Europe and Japan. We also had a pre-conference day training program for the Friends of IANDS leaders. This assisted the FOIs and also assisted in a membership growth. It was hard for us to believe, but this turned us around and our bank account increased ten-fold. Also during this time we started the networking list for experiencers. In 1990 the international conference held at Georgetown University in the Washington, DC area was also a great success. At this conference there were a number of overseas individuals both on the program and as regular participants. Then in 1991 the five regional conference were held on different dates across the country. These conferences became for us a very successful source of increasing our financial stability as well as our membership numbers. Another one of the pleasures during my years was the international contact with IANDS groups. In the late summer of 1988, while in Europe, I spent several days in Paris and visited with Evelyn Mercier and passed on some ideas for their organization. The next year I returned and spoke for a group of their members. Also in October 1988 I assisted with the founding of the German group in Heidelberg. In the late fall of 1988, while in Sidney, Australia, I met with Cherie Sutherland regarding the Sydney organization of IANDS. These international associations were also enriched by the participation of Ken Ring, Raymond Moody and myself, as well as our spouses and friends, at a conference in Flora, Norway in the fall of 1989. This conference was sponsored under the leadership of Rune Anumdsen, M.D. and supported by the hospital where he practiced in Flora. At this conference were NDE experiencers and researchers from Norway, Sweden, Denmark, Ireland, Great Britain and other countries in Europe. It was the conferences, the international associations and the true supporters who gave their all to IANDS which sweetened the bitter moments of our trials and tribulations of survival. Most days the sun does shine somewhere in the sky. That same sun touches all of us, experiencers, researchers and interested participants and often sheds light on the real meaning of the light at the end of the tunnel. And so this will probably continue to happen in the years ahead for IANDS. Yes, in the future, for IANDS some of our dreams will probably become reality. And yet, we will probably also find that there will be times when reality overrides our dreams. Yes, numbers are important and most of us would like to see all people come to understand the deeper meaning of the NDE. This would mean that not only would we more deeply understand death, but also we would more deeply understand the spiritual dimensions of life. For the two, life & death, death & life, are intertwined. I used to think that numbers in a group were the most important factor in a group's success. Today we can probably find many things which discount this answer. In my more reflective moments it feels to me that what's most important is how our lives are changed and then how this change is reflected in our personal relationships and our service with, and to, individuals. This, I feel, is one of the things which IANDS has been, and hopefully will continue to be, successful in achieving. This has happened for many experiencers, as well as many researchers and/or professionals and non-experiencers. Yes, we do need to always dream dreams and have visions, but also these dreams and visions must become, for each of us, active in the lives we live and the way in which we all treat each other. The utterly normal pattern of "coming down from the mountaintop" after a rapturous experience is no less difficult for an organization that for an individual who has had a radiant NDE. IANDS was in that "coming down" period by the time I became president, out of its early Eden days and learning to make its way in the world like any other small non-profit organization. For an association whose founders were predominantly academic and whose membership largely believed its purpose to be essentially idealistic and spiritual, the necessity for mundane business practices was an often painful exercise, sometimes felt to be even a betrayal of organizational purpose. I would characterize that period as transitional, when IANDS' survival depended on its ability to learn how to function as much from practicality as from idealism, and from management principles as well as charisma. Thomas: Do you see the roofs and spires? There sleep hypocrisy, porcous pomposity, greed, lust, vulgarity, cruelty, trickery, sham and all the possible nitwittery. Are you suggesting fifty years of that? Jennet: I was only suggesting fifty years of me. Thomas: Girl, you haven't changed the world. I love you, but the world's not changed. The world's not changed now, either. One has only to consider on-going events to know that global awareness of near-death experiences has neither transformed nor altered the human predicament. Yet can IANDS have a role in creating change and deepening understandings? I believe that by sharing what it knows, IANDS helps. The great developmental dilemma of history is that people arrive and develop one at a time, in individual packets and overlapping generations. It's hard to get a sufficient mass of change when all those developing egos are marching to their own time schedules, their individual life cycles. Nevertheless, I believe change can happen through the subtle "butterfly effect" of personal attention and focus; that a small shift of attitude here can emerge as a significant force for changes there; that a single impetus to goodness in one individual can make a difference for those that life touches. In short, I believe that IANDS' influence will depend, as always, on the degree to which each individual does the inner work that makes possible the actual living of an awareness of interconnectedness, transforming our own "hypocrisy, pomposity, greed, cruelty" into civility and mutual concern. In this new millennium as in the old, we will help most, I think, by demonstrating in our own lives how to "walk the talk." My one year as president, 1995-1996, came unexpectedly when Nancy Evans Bush decided to resign early. The high and low points of my term were one and the same, the 1996 IANDS conference in Oakland. I inherited honchoing a very troubled planning process that involved "three mysterious visitors from the West" who attended the '95 Hartford conference as the designated planners for the next year's conference. These three magi just as mysteriously disappeared without trace leaving the San Francisco Bay area Friends of IANDS local planners and national IANDS holding the proverbial empty bag. That conference, after much soul-searching and tears, did come off, thanks to the marvelous help of Debbie James (who I had providentially recruited for the IANDS board along with Karl Williamson) and Bay area coordinator Diana Schmidt. The conference turned out to be a great success content-wise even though it was a money loser because of the posh setting. High points also were answering all the mail, telephone calls and written correspondence from experiencers, researchers, and others from around the world, along with doing many radio and TV interviews and talk shows from Montreal and San Diego to Nagoya, Japan. Since leaving the presidency my sanity has almost returned to normal, although some continuing board members might doubt that. As we cross over into our own arbitrarily mandated new millennium, the NDE continues to speak to what is needed to be at one with the earth, the universe, and other planes of existence. Two interrelated actions are all that are important in life, knowing and loving, knowing in the sense of wisdom, knowing what connects and disconnects us from other humans, animals, plants, inanimate objects, and so on. We are all connected-what affects one affects all. Second, we need more loving, not as a feeling, but rather as connecting with one another. In this framework good and evil, right and wrong, virtue and sin, are easy concepts to understand; that which connects us is good, that which divides us is evil. Just know it and do it! Having an NDE helps to promote that goal or at least to learn what is needed; however, just knowing about NDEs as I state in my 1997 article, "Amazing Grace" in the Journal of Near-Death Studies and what Ken Ring, in Lessons from the Light, calls a "benign virus" or being an "NDEr once removed" helps to heal our divisions. I agree with what Raymond Moody told us at the 1997 IANDS conference in San Antonio, and is repeated in his book The Last Laugh, that the next big breakthrough in NDE studies will be "empathic NDEs" where we participate in the dying process with our loved ones, and we share in what they experience as they pass from one side to the other. These shared NDEs, if we open our hearts and minds to them, will truly change all of our lives for the better. IANDS' mission and main focus has remained constant, over the years, as we have supported experiencers, promoted education and encouraged research. Although the emphasis has changed with different boards, the organization basically has remained on a steadfast course of recognizing and honoring the near-death experience.We have avoided the temptation to become a multi-experience or multi-focus organization. Instead we have sought to be open to cooperation with like-minded organizations. We have currently formalized many practices and strategically elected board members to provide IANDS with the skills and motivation to carry us into the 21st century. We continue to recognize that IANDS purpose is critical to the health and well-being of millions of experiencers. At the same time we also recognize our need to assist in sharing our message with the health-care world. Therefore, we must assure IANDS' future and focus in order to address the millions of individuals who still flounder in the wake of their experience. We know there are millions of experiencers who do not know about IANDS. There are thousands of health care providers who want to help their patients who are having exceptional experiences. Sometimes the health care providers may not recognize the experience or may not know what to do about the experience. In some ways our work is just beginning and this transition into a new century, a new era, is the perfect climate to build an organization and expand our ability to serve. In looking back, I recognize that since the early '80s when I became a part of IANDS, I dedicated my professional life to increasing awareness of near-death experiences around the world. I would like for IANDS to be as well known as other organizations which support important health issues, such as the American Heart Association. I am hopeful as we move into the new era we will be able to grow and establish new services and bring meaning to the experiencer's journey. I hope all of you will join me in this vision of increased service and an organization recognized around the world. If each of us would utilize the power of prayer, recognize the resources available to assist us in focusing our energy and share our feeling with others our goal can be achieved. We owe our thanks to all the past presidents who shared their time with us by contributing to this issue and who, each in their own way, has contributed over the years to IANDS. This will be a year of change as we broaden and expand the IANDS board and role. As new leadership emerges, new ideas will help us achieve our goals. Also, at this time, I want to thank IANDS members, our FOIs and our current board who have dedicated their time and energy to improving our conferences, mobilizing the FOIs, maintaining the web, assuring that a journal and magazine are published, raising money for research and promoting the organization. From 2000 through 2006, it was my privilege to serve on the IANDS Board of Directors, the last three years as President. During these years, several important developments occurred in the field of near-death studies. “Near-death experience” had become a household word, though publications and productions continued to reveal an incomplete or erroneous understanding of the phenomenon. Most common was the error of equating an NDE with a close brush with death. In fact, an NDE is a profound psychological event that occurs in only about 12% of physical near-death episodes and other conditions. Researchers in the U.S., England, Holland, and Wales published results of their prospective studies—in which they had interviewed every hospital patient resuscitated from cardiac arrest over a period of months or years. These studies contributed important new information to what was already known from over 60 retrospectives studies since 1975—studies in which self-identified NDErs volunteered to participate some time, often years, after their NDEs. And people continued to have NDEs, and unlike in "the early days” of the late 1970s and early 1980s, most contemporary NDErs reported to IANDS that they and their experience had been met with openness and understanding—a credit to the work of NDErs, near-death researchers, and IANDS over the previous quarter century. And a few continued to report untoward reactions, indicating that IANDS’ work was not yet finished. While Bill Taylor was president, the Board continued to meet quarterly for a long weekend somewhere in the U.S. to advance the work of the organization. 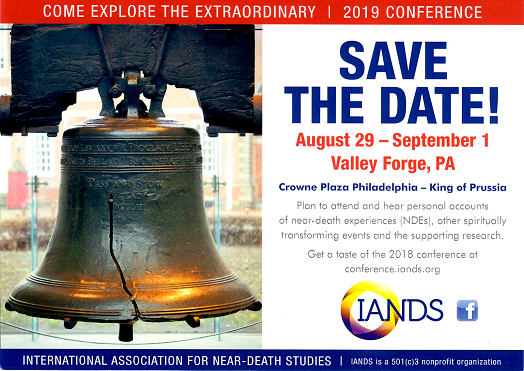 IANDS continued to publish its magazine, Vital Signs and its scholarly refereed Journal of Near-Death Studies; to maintain its website; and, with the exception of one year, to host an annual conference somewhere in the U.S.—including an especially unforgettable conference in Hawaii. During Bill’s “watch,” the first Near-Death Experiences Research Bibliography was published, providing researchers with an unprecedented resource on all periodical publications that had ever addressed NDEs; this resource was later to be updated as Near-Death Experiences: Index to the Periodical Literature. The Bruce Greyson Research Award was created and awarded first to Dr. Greyson and then, over the next few years, to additional researchers who had made outstanding contributions to the field of near-death studies. IANDS’ FOI Coordinator initiated quarterly conference calls with local Friends of IANDS interest group leaders across the U.S. to provide a venue for networking and mutual support. President Bill brought the transformations arising from his own NDE years before, to his leadership of IANDS, continuing to serve the needs of the organization’s diverse constituents, from NDErs themselves, to NDE researchers and healthcare providers, to the public at large. During my presidency, the hardworking IANDS Board, with the irreplaceable help of its office, Foxcom, continued in the accomplishment of important goals. We brought in an external consultant to guide us in a major strategic planning process—one that was largely responsible for the achievements of the next three years. We garnered substantial donations to fund a major website revision. We orchestrated the best production to date on NDEs, the BBC’s The Day I Died, to become available for purchase in the U.S., and we used a major donation to sponsor a grant program in which the program became part of the curricula of at least 12 U.S. medical schools. We continued IANDS’ publications and support of local Friends of IANDS interest groups across the U.S. and around the world. We started and garnered substantial donations to support initiatives like the NDE Continuing Education program designed for internet access by healthcare providers. We implemented the first NDErs-only retreat. And we organized outstanding annual conferences, culminating in “Near-Death Experiences: Thirty Years of Research” at The University of Texas M.D. Anderson Cancer Center in Houston, TX, in which the major near-death researchers from around the world gathered to summarize all that was known—and still needed to be researched—about NDEs. Meanwhile, we continued to meet IANDS’ ongoing challenges: Finding enthusiastic and capable people with the financial and temporal resources to serve on the demanding IANDS Board of Directors, and developing new member features, such as the electronically available Monthly NDE, to serve the membership that continued to provide the financial foundation of the organization. Looking back, my six years of service on the IANDS Board of Directors has been the single most satisfying experience of my professional career. To advance understanding of NDEs, to the benefit of all of humanity, is among the highest professional callings I can imagine. Because misinformation, lack of information, and controversy about available information about NDEs continue, IANDS continues to play a vital role in building global understanding of NDEs and ND-Like Experiences. I believe that these experiences have the potential not only to advance human understanding of the nature of death and consciousness, but also to promote more humane individuals choices and humanitarian public policy within our human family--developments that become increasingly crucial in the face of increasing technological and political threats to global peace and the continuation and quality of life on earth.